The Lee Family on the front porch of their home along Lake Charm in Oviedo, Florida. Photographed standing, from left to right, are Lillian Della Lee (ca. 1883-1977); William "Wiley" Lee (1869-1905); John Theodore Lee (1871-1959); George Lee; B. F. Wheeler; and James Hiram Lee, Sr. (1844-1920). 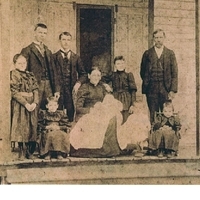 Seated in the photograph are Annie Ethel Lee; Laura Agusta Barnett Lee (1851-1940); James Hiram Lee, Jr. (1890-1959); and Charlotte "Lottie" Lee (1887-1984). The family patriarch, James Hiram Lee, Sr., was a veteran of the Confederate military, Lee served as an Orange County Commissioner, before Seminole County was established. The county courthouse was constructed in 1892, while Lee was chairman of the commission. Lee's wife, Laura, migrated from Columbia County to Oviedo and married Lee in 1867. The couple settled near Lake Charm in the Lake Jesup community (present-day Oviedo) in 1874 and had nine children. Wiley Lee married Fannie Vaughan Lee (1873-1944) and later committed suicide in 1905. James, Jr. served in the military during World War I. Lottie married Thomas Willington Lawton (1882-1963), the first elected Superintendent of Schools of Seminole County. Lillian married Winborn Joseph Lawton, Sr. (1881-1971), who served as a trustee of the First Baptist Church of Oviedo, a secretary and treasurer for the church's Sunday school, an insurance agent, and a citrus grower. She was also a charter member and the former present of the Oviedo Woman's Club (OWC), the former president of the Woman's Missionary Society, and a lifelong member of the First United Methodist Church of Oviedo. Annie married Walter Pascal Carter (1879-1939). George married Benjamin Franklin Wheeler, a prominent citrus grower, celery cultivator, and politician. Photocopy of original black and white photograph: Oviedo Historical Society, Oviedo, Florida. Digital reproduction of photocopied black and white photograph. Donated to the Oviedo Historical Society by Thelma Lee Clonts. Copyright to this resource is held by Thelma Lee Clonts and is provided here by RICHES of Central Florida for educational purposes only. Robison, Jim. "Yankees Brought Their Cash, Crackers Supplied The Sweat." The Orlando Sentinel, March 14, 1999. http://articles.orlandosentinel.com/1999-03-14/news/9903120894_1_oviedo-lee-family-clonts. "James Hiram Lee." Find A Grave. http://www.findagrave.com/cgi-bin/fg.cgi?page=gr&GRid=31838835. "Laura Agusta Barnett Lee." Find A Grave. http://www.findagrave.com/cgi-bin/fg.cgi?page=gr&GRid=31838770. "William Wiley Lee." Find A Grave. http://www.findagrave.com/cgi-bin/fg.cgi?page=gr&GRid=31838708. "James Hiram Lee, Sr." Find A Grave. http://www.findagrave.com/cgi-bin/fg.cgi?page=gr&GRid=31838577. "Charlotte Lee Lawton." Find A Grave. http://www.findagrave.com/cgi-bin/fg.cgi?page=gr&GRid=37521349. "Annie Ethel Lee Carter." Find A Grave. http://www.findagrave.com/cgi-bin/fg.cgi?page=gr&GRid=51640367. "Benjamin Franklin Wheeler (1878-1954)." Florida Citrus Hall of Fame. http://floridacitrushalloffame.com/index.php/inductees/inductee-name/?ref_cID=89&bID=0&dd_asId=1088. "Lifelong Resident, Mrs. Lawton Dies." RICHES of Central Florida. https://richesmi.cah.ucf.edu/omeka2/items/show/5671. Annie Ethel Lee; Annie Ethel Lee Carter; B. F. Wheeler; Charlotte Lee; Charlotte Lee Lawton; Frank Wheeler; George Lee; George Lee Wheeler; J. H. Lee, Sr.; James Hiram Lee, Jr.; James Hiram Lee, Sr.; John Theodore Lee; Lake Charm; Laura Agusta Barnett Lee; Laura Barnett; Lillian Della Lee; Lillian Della Lee Lawton; Lottie Lee; Lottie Lee Lawton; Oviedo; T. W. Lawton; Thelma Lee Clonts; Theodore Lee; Thomas Willington Lawton; W. J. Lawton, Sr.; Walter Carter; Wiley Lee; William Lee; Winborn Joseph Lawton, Sr.
“Lee Family.” RICHES of Central Florida accessed April 18, 2019, https://richesmi.cah.ucf.edu/omeka/items/show/5641.